Bring Me That, a Web-based service for ordering food, is a startup with the Triangle Startup Factory in Durham. This is of particular interest to you, the readers of my blog, because you tend to like food from local restaurants and Bring Me That is making it easier for their food to end up in your mouths. After launching in Ohio, Bring Me That has opened up shop for North Carolinian restaurants, and they asked me to check out the service for them. Bring Me That aims to make ordering delivery less painful by providing an online system to make it no harder than point-and-click for customers. I have definitely had the phone call or twenty that ended with me unsure I’d ordered what I wanted, so I’m behind anything that makes it easier. Bring Me That partners with restaurants that offer delivery, sets up their menu within the system, and confirms the order with the restaurant after you place it. You’ll get a confirmation email with a time estimate after that. Pretty nice! To order, go to their website (linked here), enter your zip code, and voila! First-page results for my zip code. 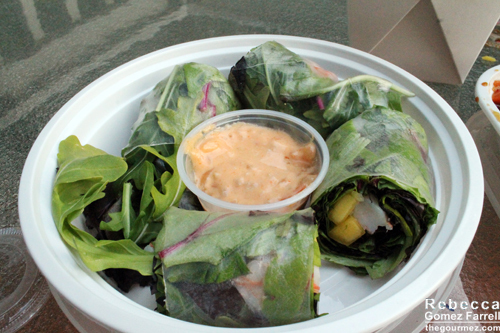 We understand that we have a lot of restaurants that cater or have high minimums. We are working on providing a filter option that will either place all these options toward the end or have the customer filter them accordingly. We’d love to add even more Mom and Pop stores, especially since a lot of customers use our site to discover Mom and Pops. We crowdsource this and encourage anyone who knows of restaurants that aren’t on our list to let us know. Also if any new restaurants come around, we personally reach out to them and try to get them up on our site immediately. In southern Durham, there were roughly five local restaurants for me to choose from. Ordering is simple. 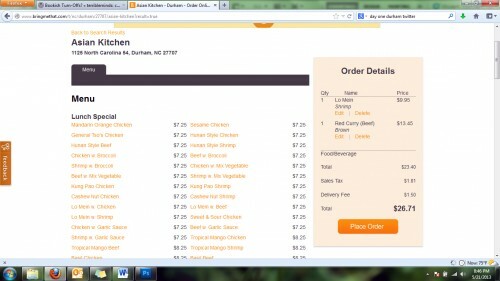 Example of the order screen. 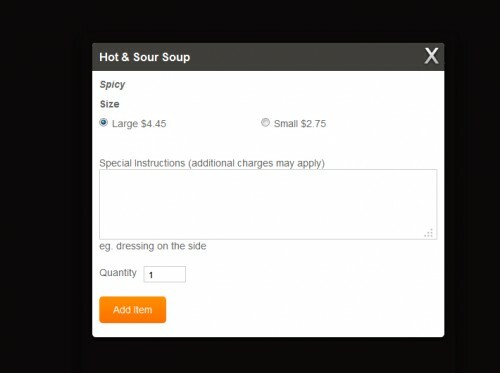 If there is no price listed on the order screen, the menu item likely has different prices based on the portion size, so you’ll see that choice as soon as you select the item. You can also add in special instructions at that point. Just confirm the order in the cart when you’re done, give Bring Me That your billing info, and wait for that confirmation email. Because I’m addicted to trying new-to-me places, I chose Ping Pong Cafe, a Chinese restaurant near South Miami. I placed my order in a jiffy. Then I discovered a snafu—keep in mind that Bring Me That is a startup, so those come with the territory. It turns out I am outside of Ping Pong Cafe’s delivery area. Now, it would be better if Ping Pong had not appeared as an option for me, but I was impressed with the customer service I received to clear it up. 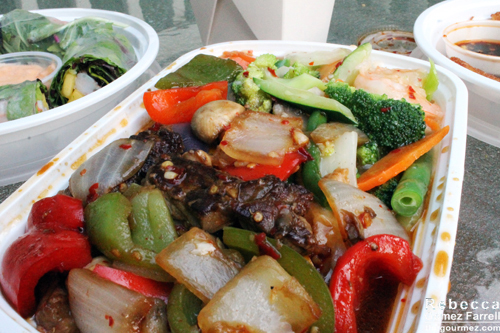 Within a few minutes of placing the order, a Bring Me That representative called to explain the problem, and he was prepared with recommendations for another Chinese restaurant. He even offered to take a new order over the phone for me and place it. It’s nice to know someone’s there to handle just that sort of problem. I placed my order for Asian Kitchen instead, and the food was at my house in half the estimated time on the confirmation email. That spread includes their scallion pancakes, Thai spring rolls, and the Thai Double Delight with tender beef in a pepper sauce and shrimp in a white sauce. Now this isn’t a restaurant review, but that won’t stop me from posting gratuitous food photography. 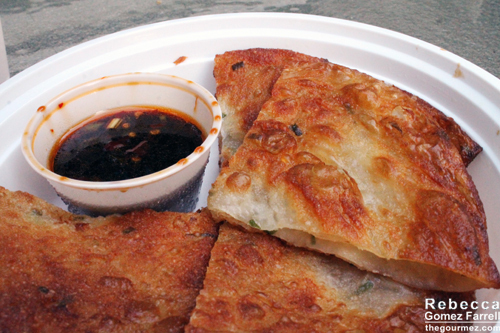 It was all delicious, especially those golden-red scallion pancakes. That food was digesting in my belly within 30 minutes of clicking on the Bring Me That site. I was quite happy with the service despite a few kinks that will be worked out in time and the modest selection of local restaurants in my area. Hopefully, as word spreads and users recommend new restaurants, that selection will increase. Tarheel Takeout and Takeout Taxi do the delivery themselves so that limits them to the amount of drivers they have, geography, et cetera. They are a great option for restaurants that do not offer delivery. We focus on the restaurants that offer delivery and make it simple for the user to see which restaurants deliver to them and then order through us online. 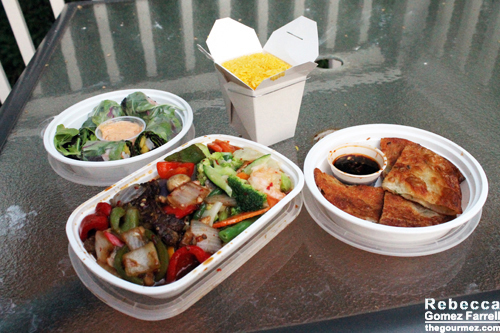 Down the road we hope to partner with other third party services like Tarheel Takeout, which will offer the customer even more options for delivery or takeout. An obvious obstacle to expansion would be the lack of a delivery person at some local restaurants, so I asked Michael if they’d had any success convincing stores to add one on so they could provide this service. We have had a lot of success increasing sales and signing up restaurants that do not have an online delivery presence. As we expand our options we will of course be able to sign up restaurants that haven’t offered delivery in the past. They have gone well. The majority [of orders] have been through individuals, and we are working on adding better functionality to the customer whether it is for a business or for a large party [to] make it more friendly to order larger items. So if you’re looking for an easier way to get delivery from a favorite local restaurant in NC, give Bring Me That a whirl. If they don’t have it yet, suggest the restaurant to them, and hopefully it’ll pop up soon. Obligatory disclosure: I was compensated for this post and my dinner was courtesy of Bring Me That. Service used on 17 May 13. What Michael doesn’t tell you is that the prices he puts online are higher than the prices the restaurant charges. Pete, I’m very sorry to hear you’re having trouble with Bring Me That! They were assuredly not a scam when I tried out their service and offered excellent customer service. I’m shocked you’ve had such difficulties. Good luck to you with working it out with Consumer Affairs–that and the Better Business Bureau are always good to contact when you have issues like that with a company. Same problem at the restaurant I work for! Nothing but head aches and confusion from customers. This is totally a scam. They charge more than the store would charge. I thought I ordered directly from the restaurant but it turned out it was not. Just for the record, I contacted Bring Me That to tell them they are welcome to respond to your complaints on this post, but they haven’t taken any action. I’m happy to let the complaints remain. I ordered online on 12/ 20/14,was billed 26$, then three days later was charged 29$. It’s a scam, they get ur order and credit card number and call the restaurant and order ur food then they keep charging ur card, please someone tell me who to call at Bring me That to resolve this issue. I should also note that Michael LaMarca, whom I interviewed in May 2013 for this post, is no longer with Bring Me That, so he should not be associated with these issues. I placed an order. Paid. Got charged. Never got my order. I am pissed. Give me my damn money back now. This is a scam. I also ordered Chinese food. Never got email confirmation like they said it would occur. Called restaurant directly and they said they don’t have email orders. Called credit card company. Bring MeThat had already charged me twice. Received no food! Have already started process to contest charges and cancelled my credit card, feared theft. This site is robbing people blind! Do NOT use!!!!!! This is definitely a scam I ordered some food from a local pizza shop was waiting an over an hour so called the pizza shop they said they dont do online orders canceled my card after I got off the phone with the pizza shop. They have awful customer service its been 30+ minutes since I asked to receive a call from them, there are 100 restaurants that “supposedly” deliver to my address and half of them won’t actually deliver, yet they still have them listed as within delivery zone. This is a company based in NYC, I live in Bergen county New Jersey. If they can’t figure out restaurants that deliver in my area I seriously doubt they can figure out what the delivery zone is in Ohio. God I’m so glad I read this! Was just getting ready to call in a birthday dinner for my son! What a disaster that would have been after the worse day ever! Yeah, at this point it sounds like “stay away” is the wiser plan! This is a scam. I work at a local pizza place in NY and we just got a call from a customer, angry because they hadn’t gotten their food. The man insisted his wife placed the order online but we do not have email ordering. The wrong phone number, address, and order were given to me. STAY AWAY FROM THIS WEBSITE. Thanks, Emma. I am amazed that this is still happening. I will amend the blog post with a warning up top. We keep vetting these reaccurring charges on our account and we don’t use these guys and never have. Can’t get any feed back from these guys. We have rrported them to BBB with the hope they can get to the bottom of this chaos. I’m sorry to hear that, JC. There have definitely been suspect actions reported here by Bring Me That over of the years. It’s why I added a warning up top. I ordered through their app then actually got a phone call from the restaurant asking where I was. I explained I ordered through the Bring Me That app and they told me they never agreed to sponsor them and they were a scam. Luckily the refunded my money.